Luke tells us in his Annunciation narrative, "And the Virgin's name was Mary (Mariam, Luke 1:27c). This is the beautiful way Mary is welcomed into the pages of the most artistic and literary of the Evangelists. She is according to the Jesuit exegete and Marian scholar, Fr. Ignatius de la Potterie, S.J., given a new name by the address Gabriel announces as he calls her attention by saying "KECHARITOMENE" that is, You who have been highly favored and graced. This new name points our Mary's holy call to be the mother of the Savior precisely because she has already been favored and graced by God for this role. 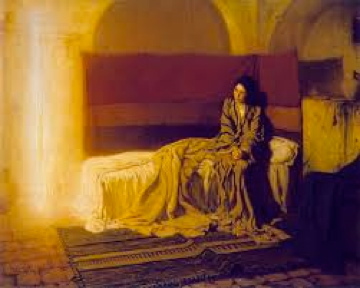 The expression is a perfect passive particple which shows us the beginning of her graced life and the mission that this will bring about, namely, the giving of Jesus as Savior to the world.The Annunciation is both a heavenly proclamation and a vocation story about Mary, the Mother of Jesus. For us Marianists, this is our patronal feast day and the center of our charism, or as Fr. Paul Marshall calls it, the lens which helps us see the other charisms of the Society of Mary clearly. For Blessed Chaminade this definitely was central to his spirituality which influenced all of his writings and his foundations. It is for the honor and glory of Mary that we Marianists do pronounce our vows to God and take on the mission of Mary of bringing Jesus to today's world. Our Blessed Founder loved this passage and always encouraged his followers to reflect upon this call of Mary. I personally take great delight in Luke's account and it is one of the most motivational parts of Scripture for me as a Marianist; the other, which comes at the end of John's Gospel is the scene at the foot of the Cross where the Beloved Disciple is entrusted to Mary and becomes her spiritual son. In the "Collection of Masses of the Blessed Virgin" the song of Mary is used for the response between the initial reading from Genesis. This great psalm or hymn expresses our joy on this Feast of the Holy Name of Mary and it comes to us from her very lips. St. Luke may have composed it, but it expresses the sentiments and praises of Mary to God that inspired him to give the Magnificat to his readers in a community that was dedicated to the person of Mary because of the role she played in the conception, birth, and education of Jesus. Here is a reflection from Blessed William Joseph Chaminade on the Annunciation: "God, in the wisdom of his counsels, predestined Mary from all eternity to be the Mother of the Savior of the world, to be the instrument of the Incarnation, which is the universal principle of grace. This choice is a gift of God and infinitely glorious for Mary. But the gifts of God are irrevocable (Romans 11:29), hence this choice will remain forever. All the graces received by us are merely applications or outcomes of the grace of the Incarnation." (Marian Writings of William Joseph Chaminade, Vol 1, p.51, J.-B. Armbruster, S.M., Marianist Press, 1980). May all the members of the Marianist Family rejoice and celebrate as we honor Mary our spiritual Mother and learn from her who to say "Yes"-- "Let it be done to me according to your word." (Luke 1:38). Fiat mihi secundum verbum tuum." Amen.